It was a gathering of the dangerous and the deviant at Depauw University this weekend. 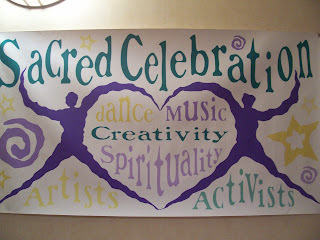 The second annual Creation Spirituality Communities Conference met for a weekend of dance, ritual, song, learning, connecting, and celebrating. 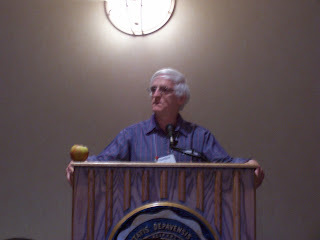 Matthew Fox (called dangerous and deviant by the Vatican) was our keynoter. 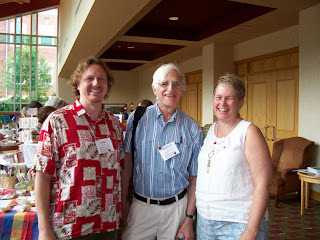 We celebrated the 25th anniversary of his book, Original Blessing, which is the primer on Creation Spirituality. The weekend also launched a new book, Originally Blessed, which is a collection of essays, poetry, art, (even a recipe), by those whose hearts have been strangely warmed by Creation Spirituality. There is a good number of theologians and activists for whom I have profound respect and for whom I am grateful to the Universe for bringing to life. Matt Fox is near the top of that list. Integrating the heart and the mind, he has been showing us in word and by example the way to live authentically. 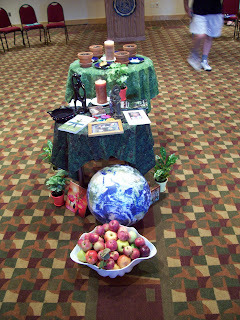 In one of our rituals we planted apple seeds and celebrated communion by eating of the fruit, the goodness of apples, the symbol of life. Our sacred space called to mind and heart, the green and blue of Earth and the life she gives us. Fox took on the Vatican and its theology of death (original sin) with a theology of life (original blessing) and reminded us of the ancient wisdom tradition of Creation Spirituality that celebrates the Universe and our creativity, takes seriously the darkness, loves the body fiercely, and embraces the possibility of transformation. He reminds us that compassion is the root of all authentic spirituality. Fox said that human beings are the first of Earth's species who have a choice about whether we will go extinct. Quoting Deuteronomy, he said, "Choose life!" 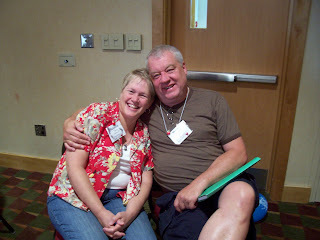 Here is Rebecca with another dangerous deviant, Wayne Schwandt, pastor of Metropolitan Community Church of the Chesapeake. 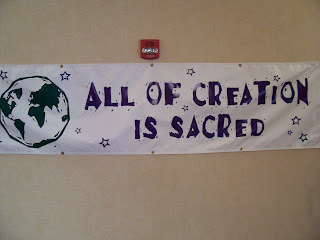 Here is a list of some Creation Spirituality Communities. First Pres. will be added to the list soon. I should say a word about the phrase 'dangerous and deviant.' This attribute was given to Matt Fox because he challenged the theology of the Vatican (and Protestant theology as well) that results in the denial of the goodness of creation and humanity and survives by the control of others. Fox is dangerous and deviant to the church, to the military-industrial complex, to empire, and to all of those institutions and ideologies that care about profit before sustainability and enforce their ideology by control and violence. These institutions are correct to denounce Fox and those who embrace the goodness of the universe, what science shows us about the cosmos, the deep wisdom of our ancestors, and the hope for a future for our planet and our species. Fox is a threat to those who hold to an ideology of death. If the biblical doctrine of creation falls, the entire storyline of the Bible falls apart.... Those who would abandon the biblical account of creation undermine the entire Christian truth claim. Any theology or philosophy that will sustain us must at least begin with what scientists around the world are showing us about our Universe. They are showing us plenty. If we open our eyes we will be in awe. Next time, I will report on the other keynoter, Nancy Ellen Abrams, who with her husband, astrophysicist Joel Primack, wrote The View from the Center of the Universe: Discovering Our Extraordinary Place in the Cosmos. Is it possible that the Catholic church has misunderstood Matthew Fox? What exactly is deviant about him? I read an interview awhile back where Fox claimed that creation spirituality does not deny the concept of original sin, but instead thinks that this should not be stressed. He instead believes that the church should emphasis the blessing, and original goodness of creation. It seems to me that Christians see a paradox here. All that God has created is good, and blessed. We are fearfully, and wonderfully made. Yet also broken, and fallen. We can not just, in our own strength, redeem creation, and fix ourselves by ourselves. How empire, and the military-industrial complex tie into this, I am definitely clueless. "...compassion is the root of all authentic spirituality." No - the Catholic church (and the Dominicans most specifically) have not misunderstood Fox dear Grace. No not at all. I was going to come here and just say "You had me at Matthew Fox" but I thought that I would be more serious and say what I did to Grace's comment. Is it possible that the Catholic church has misunderstood Matthew Fox? Since I am not RC, it would be bad form for me to pick on them exclusively, but, in a sense, yes. To put it more bluntly: the Church with a capital C has misunderstood Christ. What exactly is deviant about him? Actually, Fox's book, "Original Blessing" was called dangerous and deviant by the powers that be. As far as Christ is concerned, we can read the Gospels to discover his dangerous deviance. John, how has the church misunderstood Christ? Can you explain more fully? I think the whole problem is because (and forgive me Fran, if I offend) the Papacy has historically been a profit-and-power driven institution. And any time someone comes along and creates a model that threatens the power and/or profit, it's labelled trouble, in an attempt to isolate and starve it. Cuba is another such example. Because Cuba created a model of sustainability that threatened the US' ability to secure and exploit resources throughout Central and South America, it has been isolated in an attempt to kill it before it spread. I think if you read any of Fox's 26 or so books, you will find far more eloquent and intelligent answers to your question than I can give. It would also be a mistake to say that what Fox says is against the Church, especially as many parts of the Church are catching on to what he (and others) are talking about. I heard a quote that Fox was so ahead of the Church that the Church mistook him for an enemy. I am not voting for sainthood for Fox (as if he would want it). He is a human being with feet of clay. But he has spoken with the message of Jesus "Feed my sheep" (thanks to Madpriest for that reminder). That simple command has been misunderstood by the Church. I am sure you can count the ways.